In Agent Carter Season 1, most of Peggy Carter’s enemies were original characters created for the MCU, but the main antagonist was eventually revealed as Johann Fenhoff, a.k.a. the master of hypnotism Doctor Faustus. Peggy was able to stop Fennhoff’s plan to attack Times Square in the Season 1 finale, but she’s not done facing off against adversaries from Marvel’s large library of characters. 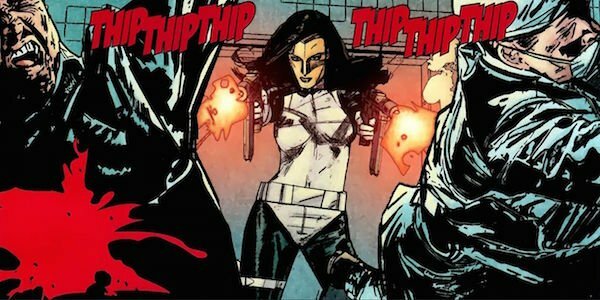 It was mentioned last month that Season 2 will include several villains from the comics, and now we know the identity of one of the evildoers: frequent Iron Man villain Madame Masque. I think we’ve changed the look of her a bit obviously. We’ve made her an actress, which is very Hedy Lamar. She was a ‘40s siren actress who was also a scientific genius, so that’s part of what we’re mining with this character. In the comics, Whitney Frost was the daughter of Count Nerfaria, leader of the criminal organization the Maggia. Because he didn’t want her connected to his illegal activities, the Count gave Whitney to his employee Bryon Frost. She grew up to be a wealthy debutante, but after her adoptive parents died, Nefaria came back into her life to reveal her true parentage and convince her to become the Maggia’s new leader. After she first refused, her politician fiancé left her, worrying that her background would hurt his career, so she decided to team up with Daddy. After Nefaria was sent to jail, she took over the organization, but while escaping from Iron Man during one of her early missions, the plane she was in crashed and her face was scarred. Just as her villainous identity suggests, Whitney covered her face with a golden, creepy-looking mask so no one would see her damaged visage. Agent Carter Season 2 will air sometime in 2016 on ABC during Agents of S.H.I.E.L.D.’s hiatus.